Quite possibly one of the worst golden animations in the game. For like 2 seconds, it's like there's no change at all. Not if Thalnos has anything to say about it. Decent arena pick. Also works kinda all right in combo druid although Stranglethorn Tiger works just as well in most cases and costs less to boot. This card is nasty with paladin. I've gotten him up to 28 attack using blessed champion twice at turn 10. If you can bate your opponent to use his taunts early and also if you can survive with a good deck. If turn 10 is too much, you can go 20 attack with blessing of might and blessed champion. Turn 8, BM, BC, and the good ol Owl to sIlence your opponents taunt, ouch! Some cards are Arena-only. This is one of those cards. It's not underrated. It's not overrated. It has a role... as a semi-decent draft pick. It's underrated. Yes you burn a turn using it, but if you are even a little ahead or even it can destroy a heavy minion or force your opponent to react to it. It's a perfect late game finisher because by the time you play it, your opponent has likely used any AOE's or taunts that can damage it. I've lost to this card a few times because of it's stealth. It suffers high-cost penalty. Hence if you trade it into other minions you lose some value. There was a weird combination for Shaman which used Windfury and Rockbite in attempt to one-shot your foe with Stealth minions like Shade of Naxx or this assassin. Not a bad rare pick in ARENA though. Underrated card, that is good in skillful hands. I hear ya got a problem. And indeed this card has one. 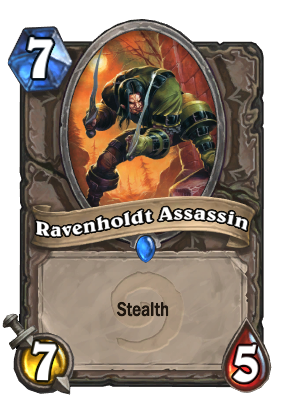 Affectionately called "Solid Snake" by me and my friends, Ravenholdt Assassin is a pretty cool card that just isn't fast enough for the current metagame. Only Druids are really in the market for 7-mana minions, and the Ancients are far better than this guy. In Arena he's decent as a top-end minion, but in Constructed, you're better off looking elsewhere. Aside from the obvious Hunter face decks and Hunter/Warlock zoo decks, many decks have slowed down a bit in the past 6 months and are now using a 7-drop... but they're using Dr. Boom. Ravenholdt Assassin is no longer too slow for the metagame; he's too weak.